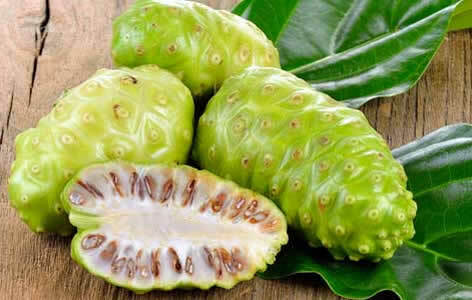 Noni, the common name for Morinda citrifolia, is a medicinal herbal substance derived from the noni tree, which is found in various areas of the South Pacific. Other names for the herb include morinda, Indian mulberry, nona, nonu, Polynesian bush fruit, Tahitian noni juice, and cheesefruit. The noni tree is an evergreen shrub, up to 20 ft (6 m) tall, that grows in tropical areas of the South Pacific, including Australia, Malaysia, the West Indies, India, Vietnam, the Philippines, Taiwan, and Hawaii. Its branches and trunk are coarse, tough wood, and the leaves are glossy, oval, and dark green. Year-round, the tree yields a small fruit, which is cream-colored and about the size of a small potato. 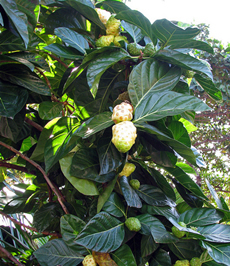 The noni fruit is noted for its bitter taste, unpleasant smell, and reportedly strong healing properties. Other parts of the plant also are used medicinally, including the leaves, bark, flowers, and roots. Noni was first found in India, and migrating peoples may have carried it around regions in the Pacific. In Polynesia, the plant is considered a sacred healing herb with many uses. American soldiers stationed there during World War II were reportedly given noni as a health tonic. 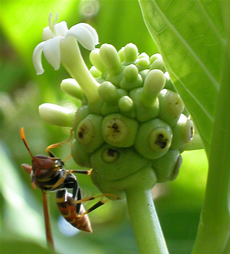 Other peoples of the South Pacific, including in Hawaii and Tahiti, use noni as a medicinal herb. Traditional uses of all parts of the plant for various conditions are numerous. Noni has been commercially grown for hundreds of years in the South Pacific region. The fruit is also a food source used by South Pacific peoples. The principal regions for commercial cultivation of noni are Hawaii, French Polynesia, and Tahiti. Noni juice became an increasingly popular health drink during the 1990s, when a group of Hawaiians began internationally marketing the juice as an herbal remedy. Since then, many claims have been made about its healing powers, a few of which have been somewhat validated by controlled studies. However, there is a lack of research to conclusively back up the optimistic claims regarding the herb’s healing powers, and most evidence of the herb’s success exists in testimonial accounts. Traditionally, the fruit has been used for aging, diabetes, halitosis, hemorrhoids, tumors, tuberculosis, high blood pressure, and as a tonic for overall health and energy. The leaves have been ingested in remedies for arthritis, digestive problems, parasites, and dysentery (severe infection of the lower digestive tract characterized by acute diarrhea and dehydration). Topically, the leaves, fruit, and roots are used in poultices for arthritis and joint pain, headaches, for burns and lesions, poisonous bites, and to improve signs of aging. Noni is used by some cancer patients for its anti-cancer and tumor-reducing possibilities. Some sufferers from immune-compromised diseases such as AIDS and chronic fatigue syndrome use noni to boost immune system function. People with diabetes and hypoglycemia have reported that noni helps stabilize blood sugar levels in the body. People with arthritis, joint pain, and inflammatory conditions have used noni. It is also used as a sedative, painkiller, and sleeping aid. Noni juice is recommended to remove parasites, to cleanse the digestive tract and improve digestion, and to control weight. It is used as a general health tonic to improve energy and resistance and to slow the effects of aging. It is also used for asthma; digestive disorders including ulcers; irritable bowel syndrome; constipation and diarrhea; and fibromyalgia, a condition characterized by fatigue and chronic pain. A substance called ursolic acid found in the leaves of the noni plant has been shown to have anti-cancer properties in the body. A Japanese study found that noni fruit contains another substance (damnacanthal) that has some effectiveness against pre-cancerous cells. Some evidence points to noni’s ability to increase immune system activity, due to substances found in the fruit (including a chemical called proxeronine). The leaves of the plant contain chemicals that may lower blood sugar levels, as well as reduce pain and inflammation. One study showed that laboratory mice with lung cancer had much longer survival times when given noni juice daily. A French study determined that the roots of the noni plant contain natural sedatives, while another study pointed to a compound that noni leaves may contain that is anti-malarial and anti-parasitic in its effects. Finally, surveys of noni users have indicated testimonial success with the use of noni for cancer, strokes, diabetes, and as a general health and energy improver. Noni has been shown to contain vitamins, minerals, and antioxidants. Noni is available in several forms, including bottled juice from the fruit; essential oil; capsules containing dried fruit, leaves, roots, or combinations thereof; tablets; teas; and topical sprays. Organically grown sources of the supplement are recommended. Noni is best taken on an empty stomach, and can be taken daily. Between one quarter of an ounce and one ounce of the juice is a recommended daily dosage for adults. Up to ten ounces of the juice may be taken by those seeking therapeutic use of the herb and who are under the supervision of a health professional. Consumers should follow manufacturers’ recommendations for capsules, tablets, and teas. In capsule form, it is estimated that 1,200 mg equals roughly one ounce of the juice. Although few allergic reactions to noni have been observed, consumers should ingest small amounts of the herb (one tablespoon of the juice) at first to test for adverse reactions. Noni should not be used by pregnant or nursing women, as there is insufficient evidence of its safety during pregnancy or for infants. Reported side effects from the use of noni include indigestion; allergic reactions including rashes, swelling, and difficulty swallowing; diarrhea; and constipation. The use of noni with potassium-sparing drugs is not recommended, due to the high potassium content in the herb. It is recommended that noni not be taken with food, as stomach acid may render one of its active ingredients ineffective. Noni can cause discoloration of the urine and may interfere with diagnostic urine tests. Noni juice may increase the risk of hyperkalemia (higher than normal blood potassium levels) in people with kidney problems by elevating potassium levels in the body.